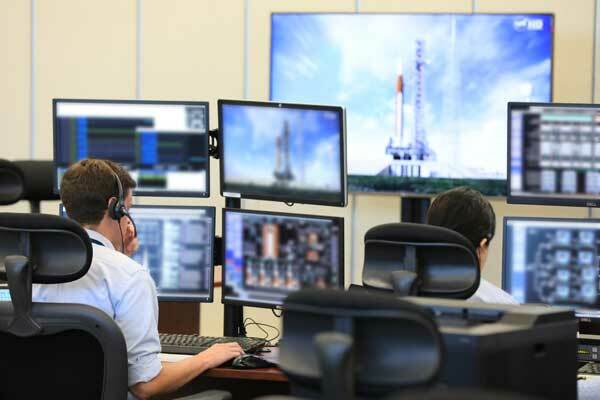 Exploration Ground Systems’ launch team at Kennedy Space Center in Florida, completed their first formal training simulation that will certify the team for the inaugural launch of the Space Launch System (SLS) and Orion spacecraft next year. The team, led by Launch Director Charlie Blackwell-Thompson, performed a countdown simulation of loading the SLS with liquid oxygen and hydrogen — complete with surprise issues the team had to work real-time. The thousands of gallons of liquid propellants that will be loaded on launch day are needed to propel the agency’s powerful rocket to the vicinity of the Moon during Exploration Mission-1 (EM-1). Video Caption: NASA is a step closer to returning astronauts to the Moon in the next five years following this successful “hot fire” test of flight engine No. 2062 on the A-1 Test Stand at Stennis Space Center in Mississippi. This April 4, 2019 test caps more than four years of testing for the RS-25 engines that will help power the first four missions of the Space Launch System rockets. It also concludes a 51-month test series that demonstrated RS-25 engines can perform at the higher power level needed to launch the super heavy-lift SLS rocket. BAY ST. LOUIS, Miss. (NASA PR) — NASA is a step closer to returning astronauts to the Moon in the next five years following a successful engine test on Thursday at NASA’s Stennis Space Center near Bay St. Louis, Mississippi. The latest “hot fire” was the culmination of four-plus years of testing for the RS-25 engines that will send the first four Space Launch System (SLS) rockets into space. Thursday, April 4, 2:45 p.m. Eastern: RS-25 engine test. 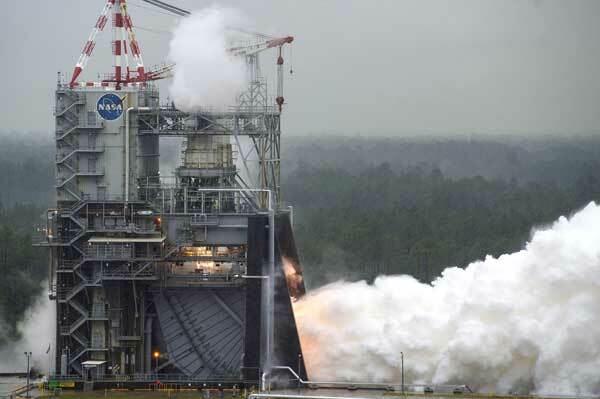 Live from Stennis Space Center, an engine for NASA’s Space Launch System rocket is fired up in a test stand. Watch it live. No. 6 with two old model Cylons. Watching the re-imagined “Battlestar Galactic,” I was never quite sure exactly what the Cylons’ plan was beyond the whole exterminate all humans with nukes thing. In an apparent nod to this lack of clarity, the producers created a two-hour TV movie called, “Battlestar Galactic: The Plan,” to explain it all. NASA has suffered from a similar lack of clarity over the past week. At a National Space Council meeting last Tuesday, Vice President Mike Pence announced it was the Trump Administration’s policy to land astronauts on the south pole of the moon by the presidential election year of 2024 — four years ahead of the current schedule. SLS is the backbone for a permanent human presence in deep space, for multiple missions to the moon and eventually to Mars and beyond. As NASA Administrator Jim Bridenstine stated in his address to the National Space Council, we’re working relentlessly to develop SLS to do what is absolutely necessary to support a NASA launch in 2020. Boeing and NASA have implemented changes in both processes and technologies to accelerate production, without sacrificing safety or quality, and we remain on schedule to deliver the first SLS core stage to NASA by the end of the year. As the commercial launch alternative studies have shown, NASA has affirmed that SLS remains the best approach to achieve our lunar objectives with a reconfirmation of the importance of the Exploration Upper Stage by EM-3. SLS is also the world’s only super heavy rocket capable of safely transporting astronauts to deep space with major payloads like landers, habitats and Gateway elements. America needs SLS’ deep-space capability in order to maintain our leadership in human space exploration. We are committed to supporting the vision outlined by Vice President Pence today. WASHINGTON, D.C. (Coalition for Deep Space Exploration PR) — The Coalition for Deep Space Exploration applauds Vice President Pence and members of the National Space Council for their leadership in calling for the return of humans to the surface of the Moon at the South Pole by 2024. We welcome the intention of this White House to accomplish these objectives “by any means necessary” and join with it and with Congress in our support of a robust program in deep space exploration. “Today, I joined leaders from across the country as Vice President Mike Pence chaired the fifth meeting of the National Space Council. Vice President Pence lauded President Donald J. Trump’s bold vision for space exploration and spoke to NASA’s progress on key elements to accomplish the President’s Space Policy Directives. NEW ORLEANS (NASA PR) — NASA and Boeing have completed the majority of outfitting for the core stage engine section for the first flight of the agency’s new Space Launch System (SLS) rocket. The engine section, located at the bottom of the 212-foot-tall core stage, is one of the most complex parts of the rocket. 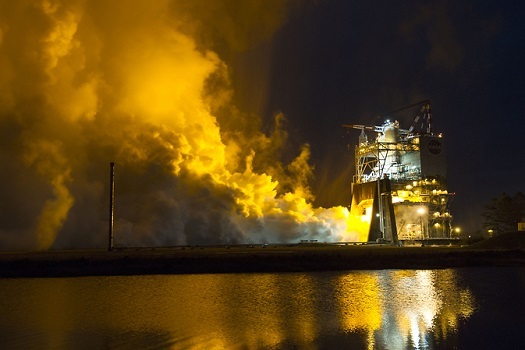 Technicians at NASA’s Michoud Assembly Facility in New Orleans have installed more than 500 sensors, 18 miles of cables, and numerous other critical systems for mounting, controlling and delivering fuel to the rocket’s four RS-25 engines. The core stage tanks hold cryogenic liquid hydrogen and liquid oxygen that are combusted by the engines to produce 2 million pounds of thrust to help send SLS to space for missions to the Moon. On the exterior of the engine section, technicians attached cork insulation for thermal protection and painted it white as well as finishing up other systems including fittings where solid rocket boosters attach. Next, NASA and Boeing, the SLS prime contractor, will add the boat-tail to the bottom of the engine section and finish up some outfitting, integration and avionics functional testing. The boat-tail is an extension that fits on the end of the engine section. The engines are inserted through openings in the boat-tail, which acts much like a fairing to cover and protect most of engines’ critical systems. The engines are mounted inside the engine section, and only the RS-25 engine nozzles extend outside the boat-tail. The team is using lessons learned building and outfitting the engine section for the first integrated flight of SLS to accelerate outfitting of the engine section for the second SLS mission. 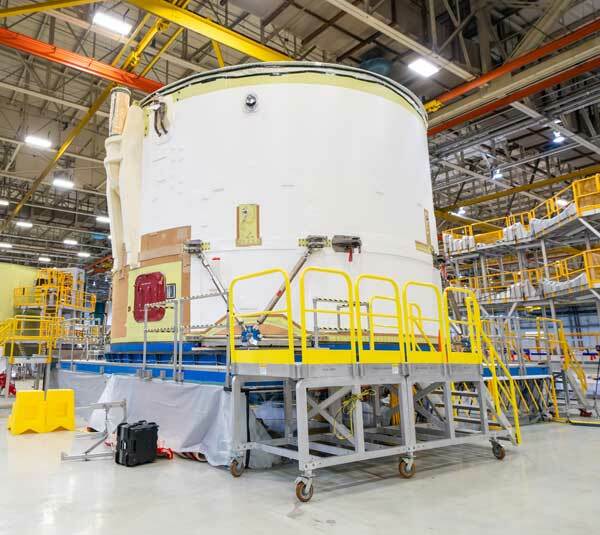 The primary structure of the core stage engine section for the second SLS flight has been built and covered with primer as it prepares for its outfitting and is visible in this image, just behind the first engine section. 2020 is a presidential election year. 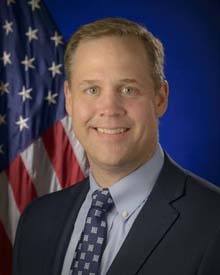 Editor’s Note: Shout out to Marcia Smith (SpcPlcyOnline) for posting a copy of this message from NASA Administrator Jim Bridenstine on Twitter. Yesterday, I was asked by Congress about the schedule slip of the Space Launch System and plans to get NASA back on track, I mentioned that we are exploring the launching of Orion and the European Service module to low-Earth orbit on an existing heavy-lift rocket, then using a boost from another existing vehicle for Trans Lumar Injection. Our goal would be to test Orion in lunar orbit in 2020 and free up the first SLS for the launch of habitation or other hardware in 2020. This would get us back on schedule for a crewed lunar orbital mission in 2022 with the added bonus of a lunar destination for our astronauts. Launching two heavy-lift rockets to get Orion to the Moon is not optimum or sustainable. Docking crewed vehicles in Earth orbit to get to the Moon adds complexity and risk that is undesirable. SLS mitigates these challenges and allows crew and payloads to get to the Moon, and eventually to Mars, safer and more efficiently than any temporary solution used to get back on track. I believe in the strength of our workforce and our ability to utilize every tool available to achieve our objectives. Our goal is to get to the Moon sustainably and on to Mars. With your focused efforts, and unmatched talent, the possibility of achieving this objective is real. There has been some push back to the proposal by NASA Administrator Jim Bridenstine to launch an uncrewed Orion spacecraft on a flight test around the moon next year using a pair of commercial boosters instead of the Space Launch System (SLS). “While I agree that the delay in the SLS launch schedule is unacceptable, I firmly believe that SLS should launch the Orion,” said Sen. Richard Shelby (R-Ala.) in a statement to SpaceNews. 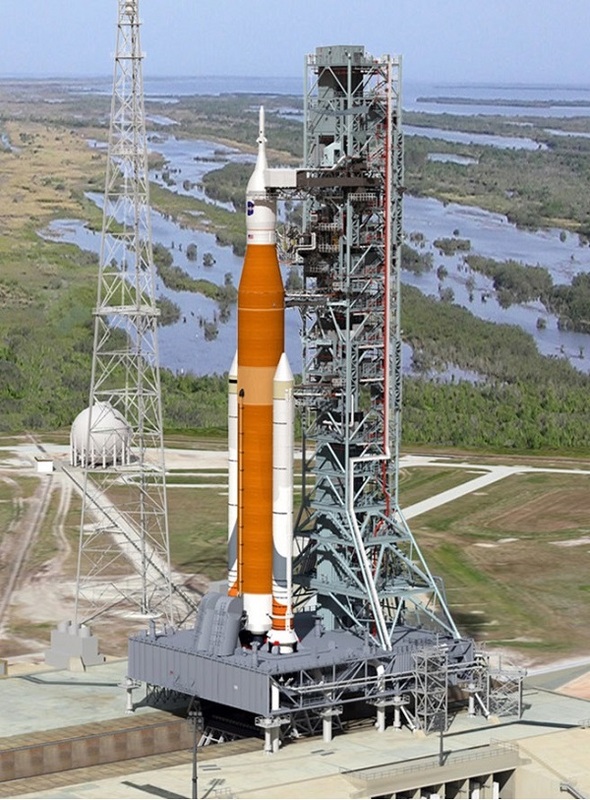 NASA has recently stated that it is reevaluating weather it can launch SLS with Orion during the first half of 2020. The schedule for this launch and subsequent flights with crews has been slipping for years. The Coalition for Deep Space Exploration issued a statement opposing the change. This morning at a hearing of the Senate Commerce, Science, and Transportation Committee, NASA Administrator Bridenstine mentioned that NASA is investigating an alternate approach to flying an Orion crew vehicle and European Service Module (SM) to the Moon by June of 2020. This approach would continue the development of the Space Launch System (SLS), enabling a full testing regime for this critical national asset, and bring SLS and Orion together for the following mission. 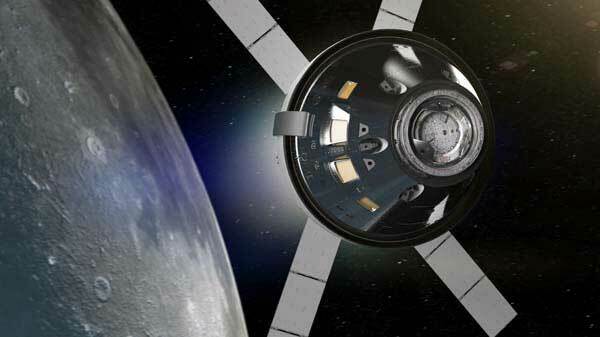 No launch vehicle other than the SLS can enable the launch of a fully-outfitted Orion, including the SM, to the Moon. As a result, the Administrator noted that this approach would require at least two launches of heavy-lift vehicles. It could also include in-orbit assembly of a launch vehicle with an upper stage, which would then be used to direct Orion and the SM to the Moon. The analysis to determine whether this approach is feasible is still ongoing. The integration challenges are significant. It is also clear that this approach would require additional funding, since the idea is to undertake both this mission and to continue development of the SLS apace. The assessment of options such as these are the hallmark of both NASA and the aerospace industry that supports it. Distributed across all 50 states in civil, commercial and military space, the aerospace and defense industry is crucial to U.S. competitiveness across the globe and to American leadership in science, security, entrepreneurship and human exploration of space. The Coalition for Deep Space Exploration and its member companies strongly support forward-leaning efforts to speed human return to the Moon. We welcome the opportunity to join NASA in the flights of Orion, SLS and the Exploration Ground Systems that support these journeys, and the rapid expansion of science, commerce and human exploration at the Moon and beyond. United Launch Alliance (ULA), whose Delta IV Heavy booster launched the first Orion capsule on an Earth orbit mission in 2014, also issued a statement. 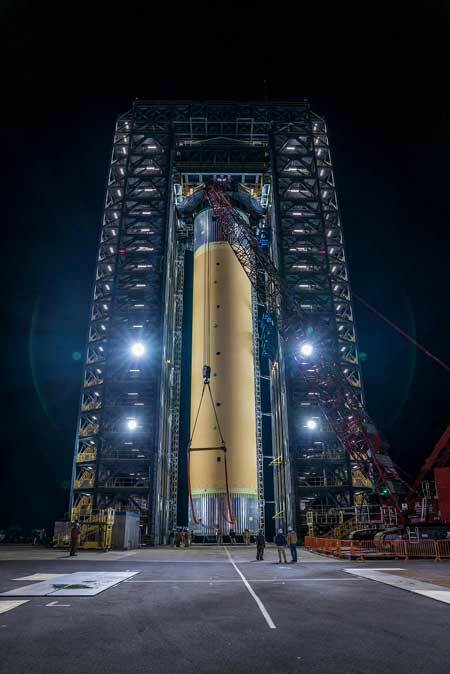 ULA recognizes the unparalleled capabilities of NASA’s Space Launch System for enabling efficient architectures in Cislunar and Mars exploration. We are proud to work collaboratively with The Boeing Company to develop the Interim Cryogenic Propulsion Stage (ICPS) for the first flight of the SLS. If asked, we can provide a description of the capabilities of our launch vehicles for meeting NASA’s needs, but acknowledge that these do not match the super heavy lift performance and mission capabilities provided by SLS for the Exploration Missions proposed by NASA. Editor’s Note: Last week the space agency said it is reassessing plans to conduct the first SLS/Orion flight during the first half of 2020.